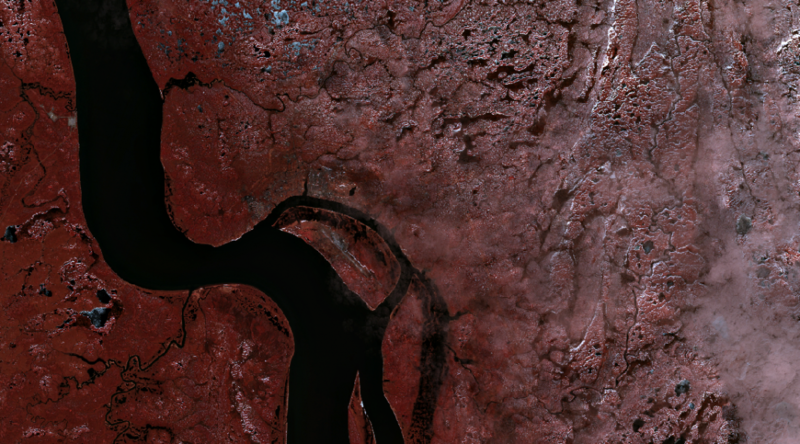 TOMCAR-SAT – Remote Sensing on the Yenisei ! The Dissolved Organic Matter (DOM) has particular optical properties in the visible spectrum. Its colored fraction, called Chromophoric Dissolved Organic Matter (CDOM), absorbs intensely in the blue part of the spectrum and then the absorption decreases with increasing of wavelengths. CDOM is often well correlated to COD, which makes it an interesting proxy to supplement, in time and space, DOC in-situ measurements. Relationships between CDOM and satellite optical signal has been widely explored to retrieve DOC in various aquatic systems such as oceans, lakes or rivers. Arctic rivers could take advantage of these works since DOC in-situ measurements are constrained by difficult logistical conditions. Moreover, 80% of DOC fluxes occur during the peak-flow period, i.e. a few weeks between May and June, after the ice-melt period. Until now, little works are focused on Arctic river systems, partly because of the difficulties to get field samples but also because of inadequate satellite data. Sentinel 2, we’re waiting for you! Since 80% of DOC fluxes occur on a few weeks in May and June we need to have a maximum of satellite acquisitions in a very short-time period. 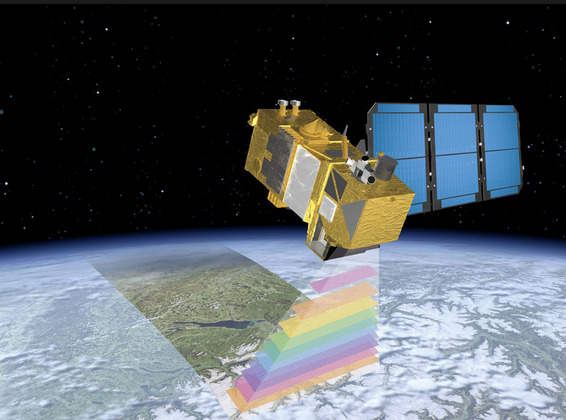 Therefore satellites with a high revisit capability are required but they must also be equipped with a high-spatial resolution imaging system to extract water-leaving reflectances between clouds (and there are quite a few…) and between ice-breaks just after the ice-melt, which is not always possible with coarser resolution data. Moreover, if combined with high-temporal resolution, atmospheric corrections are often better which may be precious in order to make a link with in-situ absorbance measurements. Yes but here, until now, no optical satellite sensors combine both aspects. Satellites such as MERIS or MODIS have a high temporal resolution (1 to 8 days) but their spatial resolution is weak (250 m, 500 m, 1 km). High-spatial resolution satellite such as Landsat or Spot (respectively 30 m and 10 m in multi-spectral mode) could be suited but their low temporal revisit time (> 16 days) is too limited to provide sufficiently useful data in the peak-flow period. So, what to do ? The new generation of satellites being launched by European Spatial Agency (ESA), called Sentinel (Spatial Program Copernicus), should be filled these gaps. The Sentinel mission is a collection of 10 satellites successively launched between 2014 and 2029. Among them, various sensors (Radar, Multispectral Imager, Radiometer, Sonar) will allow diverse applications such as monitoring of land areas and oceans, informing on climatology and meteorology or adjusting altimetric readings. Sentinel 2A and 2B are the most interesting for us since they will observe the totality of land areas every 10 days with a spatial resolution of 10 to 60 m in 13 spectral bands from visible to infrared. S2A was launched in June 2015 whereas S2B will be launched in the second part of 2016 and the combination of both will allow the acquisition of a high-resolution satellite image on the same region of the Earth every 5 days! Nonetheless, we will have to wait longer to have exploitable Sentinel 2 time-series in the region of Igarka. They are not still fully operational for various reasons (technical, programming..) which delays the availability of high-temporal resolution data. Moreover, but it is rather a good piece of news, Igarka was selected by the Theia Land Data Center for the distribution of atmospherically corrected satellite scenes that will come in Summer 2016. About this topic, don’t hesitate to read the very nice blog “MultiTemp” hosted by the CESBIO lab (http://www.cesbio.ups-tlse.fr/multitemp/). It helps understand the challenges and opportunities of the Sentinel 2 mission as well as the different processes carried out by the Theia Land Data Center. Last year, the orbit of Spot 5 was lowered in order to increase its temporal resolution to simulate Sentinel 2 over a few selected sites. Called “Spot 5 Take 5” (S5T5, see here : http://www.cesbio.ups-tlse.fr/multitemp/?page_id=406), this short experiment allowed us to have Spot 5 scenes (Green-Red-Near Infrared-Short Wave Infrared, 10m) every 5 days from 09/04/2015 to 06/09/2015. DOC/CDOM in-situ measurements were carried out by the TOMCAR team on the same day as the S5T5 acquisitions. By using these data with Landsat 8 data, a DOC model retrieval from surface reflectance was successfully calibrated since it allowed to predict DOC concentrations with a predictive error of 1.4 mg/L. 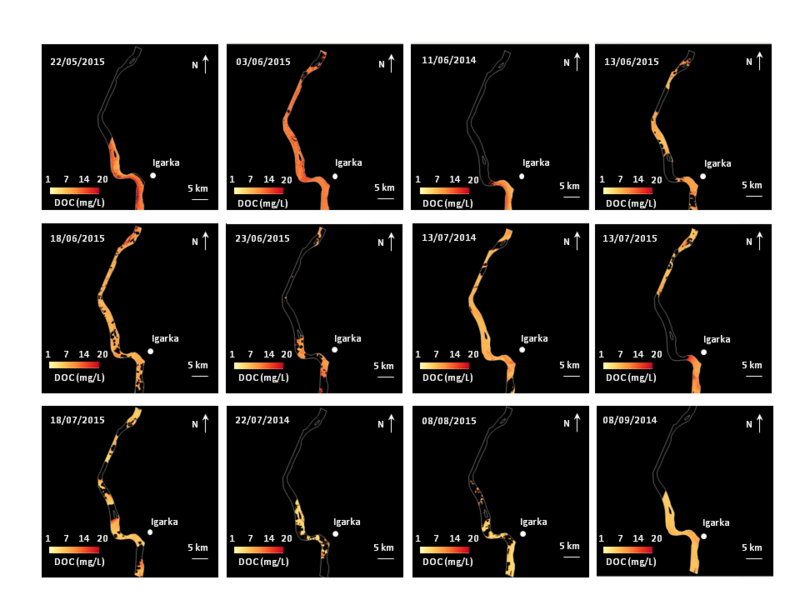 We could produce a first spatialization of DOC concentrations through the Yenisei river stream at a high-spatial and a high temporal resolution that you can see below. Despite an important cloud cover, peaks of DOC concentrations are well visible in May and June, i.e. during the peak-flow period, just after the ice-break. It is also possible to observe a linear decrease of DOC from mid-June to September, which is consistent with field observations. But this time, we can see it at large scales! All details of this work are not described here but if you’re interested, our talk presented in the Living Planet Symposium of ESA in Prague on May 2016 is available on this page: http://www.cesbio.ups-tlse.fr/multitemp/?p=7647). Note the diversity of the applications of Take 5, it’s fascinating! In short, this work shows that Sentinel 2 mission was promising for DOC monitoring in Arctic rivers and should allow to improve it. I will talk later about these works and also how we plan to explore S2 satellite images to monitor snow cover and vegetation in the Yenisei catchment. See you…Grizou, you’re a king!